It’s been a long month. Not in the “Oh, dear Lord, why can’t school be year-round?! !” way, but more in the “There is so much to be done and it feels like once school starts, we lose a lot of the control of our time and hand it over to school and to activities and to work” way. All these other parts of our lives are lurking in the shadows, waiting to pounce and reintroduce a constant state of immediacy and urgency that we have sloughed off over the summer. I wanted more tender moments and long days at the pool. We had some small moments, which matter just as much, and the weather just didn’t seem to get hot enough for the pool to seem a relief. We vacationed and played, we said yes to the kids’ requests as much as we could (certainly much more than we do during the school year), we took trips, we treated each day with the dog as something special, we celebrated birthdays, we tended to the sick, I had a few procedures, we floated through our days. The kids have a late start to school this year, so we still have a few more days, but the tone has started to change gradually, as the sunlight is now angled just a bit lower in the afternoon. The worries return, the expectations, the need to please, the frustrations and successes, the external forces. Not that it was all easy, of course. I have three children, after all. But generally easy enough that I didn’t feel like a World Eater most evenings. Somehow, I’ve managed to write every day an average of over 1000 words (I count one hour of editing as 1000 words, hard-earned.) I’ve submitted and planned, organized and deleted, set up structures that might hold up. I’m in a state of preparation because for the first time in 9 years, I will now have six hours a day to myself five days a week. It’s the writing time I’ve fantasized about for decades, first set aside for career, then for children. And I’ve tried to take in as much of the world as I can while taking in as much of my children as we can all stand. I’m always fascinated by our culture of body shaming and body punishing to achieve something “perfect”. We’ve now changed the vocabulary somewhat – from “diet/thin” to “healthy,” but the shame and the punishing (internal and external) don’t seem to be much different. This article touches on the difficulties of not fitting into a very narrow (pun intended) mold while the culture around us now claims that being a certain size is an indicator of health, while still rebuking anyone not a size 2 or smaller. As my feet sink into the muck of middle-age, I worry about being 20 years too late to become a writer. Then there’s this. Phew. Toni Morrison never fails to deliver. An important read for those of us who have been “cold” (or bitchy, or stand-offish, etc., etc.) but a more important read for those who have described others that way. And before you call me to complain about this post, read this. This book. This book. This book. One of the few I’ve read that made me wilt because I will never write anything this brilliant and that I’ve also tucked into my purse to always have on my person. With exceptions, “funny” is almost always subjective (otherwise how could we explain a world where Carrot Top and George Carlin both had the same job description?) but some words are pretty funny to almost everyone. 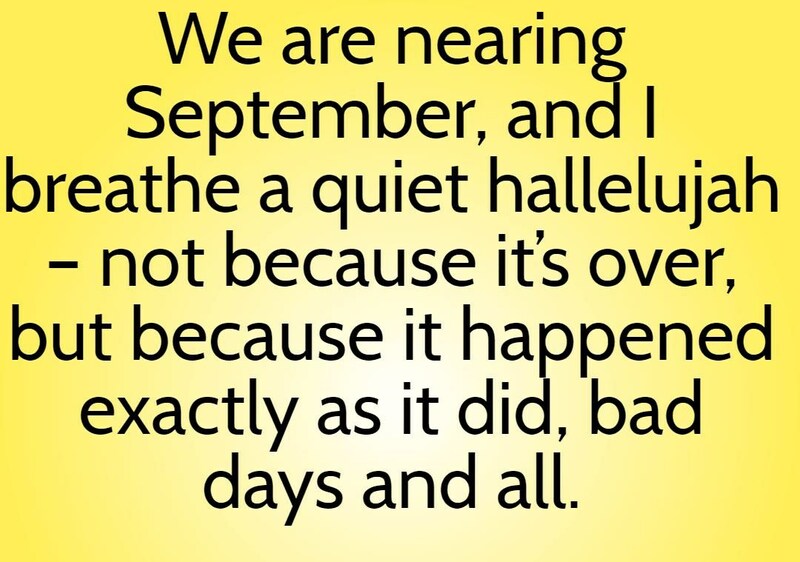 We are nearing September, and I breathe a quiet hallelujah – not because it’s over, but because it happened exactly as it did, bad days and all.